I was recently asked to review the look and feel of a website for someone. 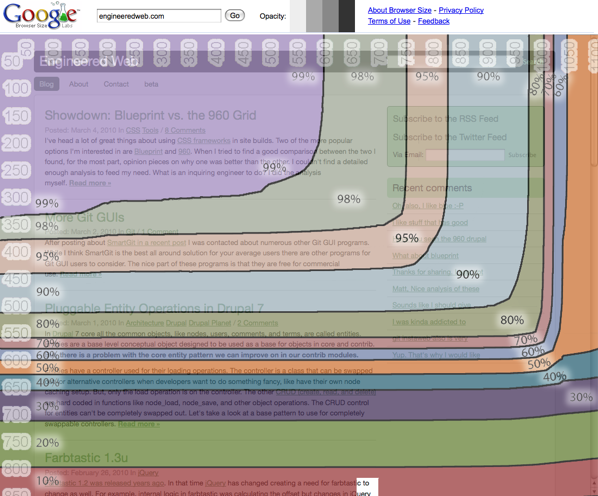 When I first looked at the site I was surprised at how wide the content region was. Sitting at close to 1200 pixels wide I thought to myself, there's the first red flag. But, when I pointed it out to the site developer he didn't think the width was a problem. After talking to him for a few minutes I discovered that he was under the impression this was now an acceptable resolution to use. He was under a false impression. But, how do you show someone they are wrong? Browser Size is a tool that can help do just that. It takes a look at page size and shows you what percentage of browser users can view how much of the page. If we take a look at 1200 pixels we see that only 50% of those surfing the web can view that width without having to horizontally scroll. Yikes! There are exceptions where 1200 pixels might be appropriate. An internal organization web application where the organization controls all the monitors is one example. The web at large is just not a place for that.